Service extensions to Manchester Airport and Chester are deferred, but the May 2018 timetable is better than we feared. Northern should still bring in all promised enhancements by the end-of-2019 deadline. We want them to introduce committed new services whilst improving — not damaging — service patterns for local passengers between Manchester, Calderdale and Leeds. Back in February we had serious concerns about what we’d seen online about the May timetable. We were promised trains to Manchester Airport and Chester, but it looked like Sowerby Bridge and Mytholmroyd could be missing Sunday trains to Manchester, some important peak services seemed to be missing and there was a serious issue about “clockface” patterns. The good news is that the above concerns have been at least partly addressed. Chester and Airport trains are deferred, awaiting a next cascade of diesel rolling stock when the late-running Bolton line electrification is finally done. And the trains shortage affects existing services on the Calder Valley Line. Big disappointment is truncation of Blackpool-York services to Preston-Leeds—however temporary. It is hoped some repairs to the damage will be made by the end of this year. Here are some of the May 2018 changes. With a major recast a lot of times are changing. Not everyone will be happy! A relief for Calderdale-Leeds users is that the extra Halifax-Leeds train operated by a 5-car Grand Central unit will not only continue to run but will start back from Hebden Bridge at 0702. And it will have a return working at teatime. The latter in particular means additional capacity. But it is difficult to be optimistic about further early relief for overcrowding at least until the new trains are in full service by the end of next year. in compensation for existing Calderdale cross-Leeds users. With the Airport and Chester services deferred, it’s odd that extension of Leeds-Brighouse-Manchester trains to Southport is going ahead, increasing frequency on the Manchester-Atherton-Wigan line. Sounds like Calderdale’s loss is Atherton’s gain! Southport is surely the least useful of our new destinations. Southport and Wigan people would really rather have trains to Manchester Airport. Wouldn’t we all?! Northern have said they will restore Blackpool-York as soon as trains become available. It is expected that the service will then become fast Leeds-York, which sounds like good news. Sowerby Bridge and Mytholmroyd do, thankfully, keep their hourly Sunday service to Manchester, and in addition have all Blackpool/Preston-Leeds/York stopping — news we’ve been waiting for! But Mytholmroyd is not shown in Northern’s online pdf York-Blackpool timetable. We shall see if it’s in the eventual printed version. At time of writing online timetables were still showing a 2-hour late evening gap in trains back from Manchester to these stations. We raised this with Northern and it sounds like a genuine error which the train planners are now working to fix. Fingers crossed. Clockface patterns are far from ideal. Just as an example, Halifax towards Leeds is now roughly 00, 12, 34, 43, deviating significantly from even-interval (but better than feared). Annoying variations between hours could make people miss trains. Some journey times increase. Eastbound Preston-Leeds trains call at Bramley, whilst Huddersfield-Hfx-Leeds trains are non-stop from New Pudsey. Overall verdict: rather messy. Last December. Signs at stations bore good news: Calder Valley trains going hourly via the brand new Ordsall Chord beyond Manchester Victoria to Oxford Road station on the south side of the city. Actually, apart from Sundays, it was never quite hourly. But never mind. This was a stepping stone to regular CVL trains through to Manchester’s Piccadilly and Airport stations. And the trains served very useful Deansgate station (though maybe temporarily). But in the new timetable all CVL trains once again end at Man Vic, and won’t be going round the chord again until the Airport service starts, maybe later this year, maybe next. More clockface and journey time issues. Leeds-Brighouse-Manchesters are fast Rochdale-Manchester, a gain partly lost by extra time westbound Brighouse-Sowerby Bridge. Would it not be better to hold them in Brighouse station, rather than have the trains waiting for signals at Milner Royd? Issues like this should be helped when new signalling is commissioned. The Leeds-Brighouse direct trains overtake the ones via Bradford in both directions. This makes a mockery of the franchise Train Service Requirement of 2 trains/hour Brighouse-Leeds. If you just miss the direct train (or it’s cancelled) you might as well wait for the next one a full hour later rather than get on one that is overtaken. With “pathing” time approaching Huddersfield—which actually means waiting at the signals at Bradley Junction— Brighouse-Huddersfield is now typically takes 14 minutes. Surely some better solution to both of these problems can be devised? Leeds-Brighouse-Manchester will be running later in the evening, but not yet on Sundays: we shall keep pressing for that. Sundays Leeds-Halifax-Brighouse is more or less hourly, a promise delivered, though with irritating variations (dodgy clockface again). Three Northern booklets (8, 36 and 45) are still required to show the whole CVL service—somewhat unsatisfactorily. And they won’t be available in print until June. We understand there is a plan to improve the booklets. Dare we hope for a clear, well presented Calder Valley line booklet showing all services when Northern Connect branded services are introduced in December 2019? This is clearly something that Northern find difficult, but remember West Yorkshire “Metro” produced complete line timetables right through from the 1970s to a year or so ago. Why can’t Northern under Arriva replicate what the county body used to do? Halifax station. Wanted: future-proof design! Overview of Halifax station concept design. Note: natural stone extension of 1855 Building to north with modern glazed concourse attached; restored pedestrian underpass using Navigation Road archway. 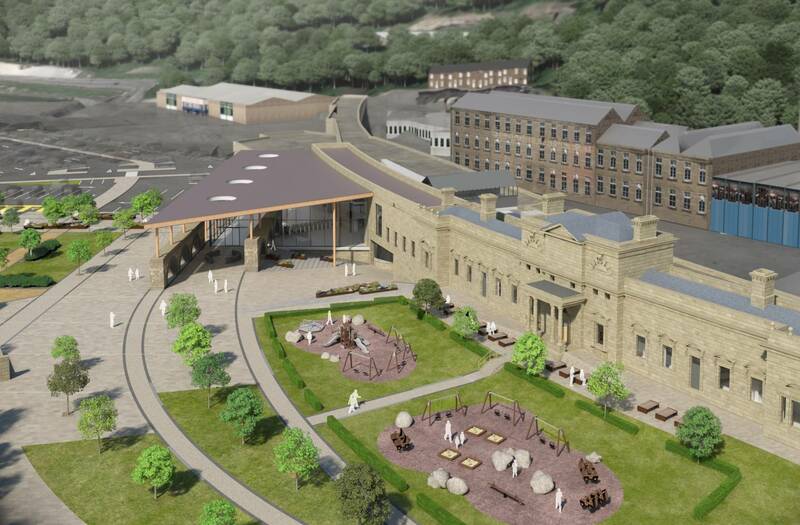 Calderdale Council is setting the ball rolling to transform Halifax station. The expected result will be a new centrepiece in the lower part of town linking with Halifax’s developing cultural hub, shopping and business areas. Bus-rail interchange should improve with bus stands serving a wide range of destinations located by a new public square below the complex of attractions around the Piece Hall. New pedestrian access to the train station is expected to be via improved public domain in the new square and pleasant “station gardens”. Direct routes will lead pedestrians arriving by train towards Square Chapel, Library, Piece Hall, Industrial Museum as well as the towns shopping and business areas. As currently envisaged the transformation will include a new glazed concourse complementing and literally reflecting the original 1855 station. There will be space for increased numbers of passengers and increased facilities for them both in both new and old buildings. The 1855 building could be home to new leisure or retail facilities attracting more people to the site. The original Navigation Road underpass will be opened up as a pedestrian link not just for station users but for anyone needing to access between new development to the east around the Nestlé site and the town centre. Comparison has been drawn with Sheffield where the rail station, at bottom of town as in Halifax, now opens out onto a modern public square. It needs to be emphasised that concept designs described in the report to the council’s cabinet on Monday 19 March are just a starting point. HADRAG will keep up pressure to get a final design that puts first the needs of train passengers, whether they access on foot, on bike, by park and ride or by drop-off/pick-up/taxi. And we encourage others to make their views known. HADRAG fully supports the transformational aspirations. There now seems to be a consensus that the present road approach bridge with its road congestion and indeed safety issues has to go. The bridge, inadequate for the coming and goings of station users on foot or in vehicles, is also an architectural detraction from the glorious original 1855 station building . Initial suggestions in the concept design would relocate not just rail users’ car-parking but also taxis and drop-off/pick-up to the east side of the railway. All levels from restored underpass up through the new concourse to the footbridge would be connected by a new lift. Clearly the lift will have to be highly reliable! But we have a serious concern that the proposed arrangements could mean indirect and inconvenient transfer routes between car and train. We say this needs further thinking. One idea known to be under consideration is having a further lift and stairway going up through the Navigation Road archway direct to Platforms 1 and 2. Restoration of the archway below the station pedestrian link will put the station on a through route for pedestrians between the town centre and potential new development to the east. So the station will no longer be a dead end for people on foot. An underused office block owned by sweet manufacturer Nestlé (who make Mackintosh’s Quality Street on the site) could be demolished to make way for the new car park. Could this be a general as well as rail users’ car park? We also want a design that offers flexibility to develop new and improved train services, and we shall be working to persuade the railway authorities that our station needs not just the reinstatement of Platform 3 to deal with growing numbers of passengers, but also a third operational train track to deal with potentially increased and more complex services in the future. The concept designs envisage widening, building out P3 to serve the track currently serving P2. This would vastly increase circulation space for passengers with trains going west and south using P1 (as now) and trains for Bradford, Leeds and York using the restored enlarged P3. In effect the station would be doubled in size, creating physical room for crowds arriving for events at the Piece Hall as well as providing a spacious, modern environment for business and tourist visitors. At present rail infrastructure company Network Rail seems to be saying it can not see the need for a third operational train platform within its current planning horizon. At a station where passenger footfall has roundly doubled in a decade, we ask whether the railway is being sufficiently ambitious. We want a design that is truly future-proof! “It is many years since HADRAG first called for Halifax train station to be transformed as a welcoming gateway between railway and town. The station gateway proposal coming from Calderdale Council shows the ambition to do this. We discussed the concept designs at HADRAG’s committee meeting this week (Monday 12 March), and they look truly transformational, making the station itself a much more attractive feature at the centre of a greatly enhanced environment linking with new bus stops, the Piece Hall, cultural hub and town centre. “HADRAG therefore welcomes the broad concept as presented but wants to see further work done to ensure the best possible access for existing rail users. Wherever possible, level horizontal routes are better than either stairs or lifts. The architects of the final scheme must consider how passengers will negotiate changes in levels, as well as the need to create a direct route between the proposed new east-side car park and the current station platform. “We also think that, rather than completely segregating pedestrian and vehicle access, drop-off, pick-up, cycle and taxi access could be retained on the west side of the station – the “town side” – where pedestrians will access through the proposed station gardens and a new public square. “The final design must be future-proof, allowing for greatly increased train services and new service patterns. Reinstatement of platform 3 will create space for growing numbers of passengers. We think it should be done so as to allow in the future for an additional railway track, giving three fully operational lines so that more trains can run through, terminate and reverse in the station. So far the railway authorities haven’t seemed interested in doing this. We need to persuade Network Rail and the train companies to have greater ambition matching the local ambition of the station scheme itself. “Opening up the Navigation Road arch puts the station on a transformed pedestrian route between new development east of the line and the town centre. This should make the station a centrepiece. With new development in and around the historic 1855 Building the station hub should become an attraction its own right. “But most importantly it must also be designed to work for train passengers, better for both existing users and increasing numbers in the future.